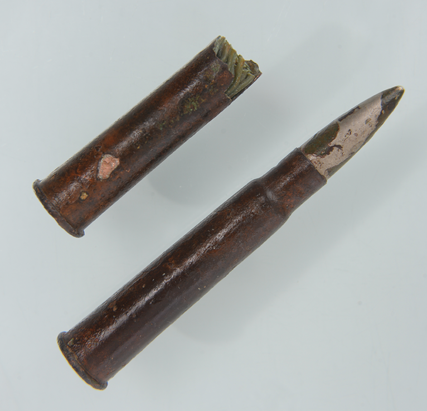 These cartridges were recovered from the Aud shipwreck. Initial research indicates that the .30 calibre rounds were designed for use in the bolt- action Mosin-Nagant M91, a Russian made rifle, and the most numerous cartridge type found in the Aud’s cargo. The story of the Aud is a significant part of the 1916 Rising story. A German gun running ship, it arrived in Tralee Bay Easter week 1916 laden with a cargo of arms. The ship was due to liaise with Casement and men on shore but nobody met the ship. Ultimately the ship was scuttled in Cork harbour. The arms did not make it into the hands of the rebels. However, the ships cargo was used as evidence against Casement in his trial for treason. The outcome of this trial resulted in his death. The cartridges were conserved in autumn 2013 with funding from the Heritage Council.